Very often, people who are doing the repair in the room or come up with for her interior, you need to make it a thumbnail in the future. For artists, builders or architects who are used to dealing with drawings and sketches, it is not difficult. But such work can make to everyone. Perhaps not as perfect as professional, but perfectly understandable to themselves and others. How do you do it? Measure the length, width and height of the room, which you need to draw. For example, suppose that its height will be equal to 3 m, width 5 m and length 4 m.
Draw on paper a rectangle ABCD. The segments AB and CD is horizontal (width of room), and segments AC and BD vertical (height of the room). The segments BD and CD will divide into 3 and 5 equal parts. In scale they will be equal to 1 m.
Measure and draw a horizon line parallel to segment CD. Usually it is at a height of 1.6 m from the bottom line, i.e. in your case from segment CD. Label the point of intersection of the horizon line with segments AC and BD as H1 and H2. On the horizon, find the center and mark the point E. This is the so-called vanishing point, a point where you focus your gaze. 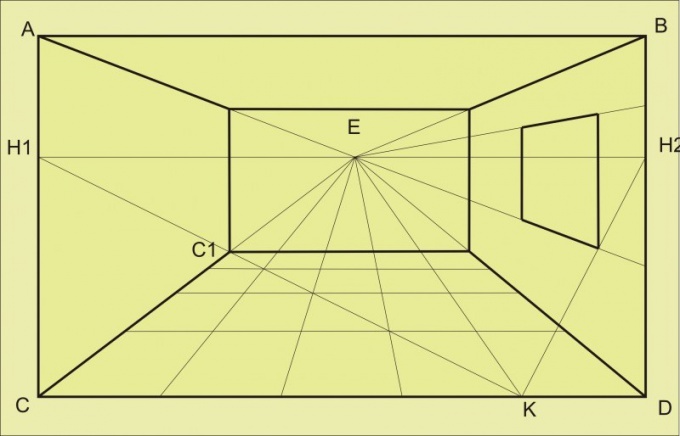 To get the corners of the room, from the points A, b, C and D draw lines to the vanishing point E.
Cut the CD (the width of the room which is 5 m) had been divided into 5 equal parts. 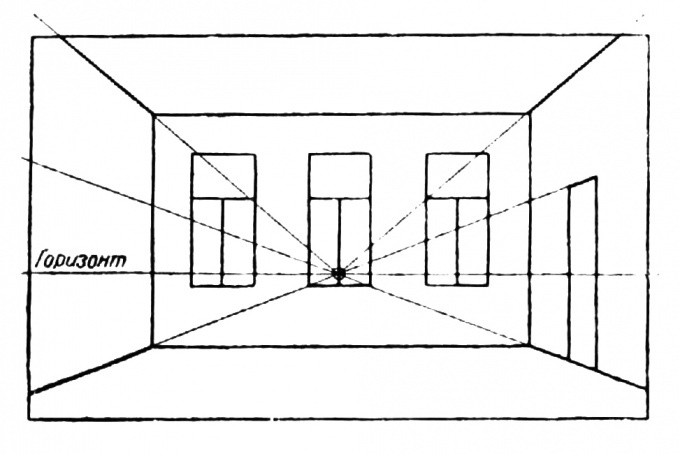 Now from each point of division draw lines to the vanishing point E.
To paint the opposite wall, you're looking at should on your drawing to indicate the depth of the room (this is the length of the room 4 m). To do this, from the point D1 on the segment AC, draw a line to the segment CD, for division 4. Label this intersection as point K.
The intersection of the cut with cut Н1К CE mark point C1. From this point up to the right and draw lines to the intersection of their diagonals AE and DE. From the points two lines that closed the rectangle opposite wall. So you could easily draw a window and door and interior, located right and left of you, you need to properly scale them in depth. For this you should conduct a parallel horizontal lines from the intersection points of the segment Н1К with the lines that you previously spent each division cut of SD to the vanishing point E. the lines should intersect with the lines EC and ED (the corners of the room). On the wall to the right of you, draw the window. For example, suppose it is at a distance of 1 m from the edge of the room where you stand. From the point of H2 swipe cut to a point lying on the segment CD. On the segment BD (the height of the room) designate a point of the window height from floor to window sill. From this longing to vanishing point E draw a line. In the place of its intersection with cut Н2К supply point and then from it draw a vertical line, which will be the height of the window to scale. To correctly indicate on your drawing the height, draw a line from the vanishing point E of the segment BD at the height that you need (i.e. from the sill to the top of the window). The width of the window, i.e. its depth in the term defined by the lines that you used to spend parallel to segment CD. On the same principle are drawn in the door and all of the furnishings. You decided to decorate your apartment to give it an individual character. To liven up a dull and boring wall, draw her a beautiful picture from a magazine or from the Internet, and the room immediately starts anew. But if the picture on the wall you get bored, repaint the walls again. Find a picture or ornament that you want to see on your wall. If you can draw, you can move your picture on the wall, you will not be difficult, just looking at the picture. Otherwise, do not worry, pick up a ruler and a pencil. Divide the figure into squares, the same number of squares, draw on the prepared wall. Carefully inspect the wall where you plan to draw. If the wall is covered with plaster, the pre-Prime it with acrylic primer to your paint, well kept on the surface of the wall. A good option if the wall is already paintable Wallpaper. They do not need anything to cover, and you can immediately draw. Pick up a pencil and using the picture, apply the pattern on the squares. Filling each square on the wall must correspond to each square in the picture. Thus, the whole of your drawing will be transferred to the wall. Use acrylic paints to paint the figure. They are water-based, odorless, great for work indoors. Acrylic paint, dilute with water to your desired consistency. Texture paint for drawing on the wall should be average. Liquid paint can leak, and thick paint is difficult to spread. Acrylic paints mix well with each other, you will not have problems with shades. After drying paint does not need anything to fix, they are not erased. For drawing small drawings use templates. Template you can cut yourself or buy at the store. When you cut a home-made template, use tracing paper or thin plastic that when in contact with the paint pattern is not soaked. Pin the template on the wall with masking tape. Apply the pattern with a sponge, which will remove the excess paint. If the sponge is too wet, the paint can flow under the stencil and spoil the picture. After you paint the template immediately remove from the wall, so that it is not stuck. For drawing on the wall you can use gouache or water-based paints. Look good small figures or ornaments near switches and outlets, next to the wall sconces. One of the most creative ways to decorate your own home are drawings on the walls. In modern apartments and cottages, you can often see a lemon tree, stretching its luxuriant branches on the side of the balcony or the amazing rose growing on the wall of the kitchen. So how do you draw a picture on the wall? Initially you need to decide what exactly you want to draw, and how your drawing will be combined with your interior. Often this combination is achieved through the color palette. In other words, if your room is in beige-brown hues, then, for example, poisonous green would be inappropriate. Next the idea is better to put on paper. So you can work out all the details, and the picture on the wall will not require corrections that do not so easily. Once you have painted your masterpiece on paper, it is necessary to make a preliminary sketch and measurements. Will be very upset if your drawing will not fit on the allotted space, but a simple pencil and ruler will help you to avoid this. The next big step is paint choice for printing in color. It is feared that the paint can leak, and then your creation if not fully lubricated, it will be ugly streaks. Therefore, when choosing paint, pay attention to what premises is wet or dry, internal or external. In some cases, you can use gouache, it becomes most resistant when mixed with PVA glue. Sometimes the amount of jars we need paint too large, in this case, you can buy white paint and color different colors. 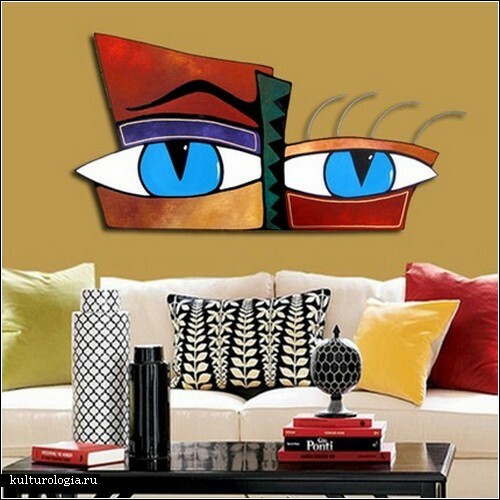 Also decorate the walls of your home can not only major figures, but also different patterns. Now it is very relevant Chinese characters or patterns-webs. The roughness and irregularities of the wall you can use to your advantage: make the figure volume fully or partially. These drawings look more interesting and to successfully hide the irregularities of its surface.Thus, it is easy to experiment with the design of your home. Familiar Wallpaper gradually fade into the background, and do not be afraid of innovations. Social networking has become an integral part of modern virtual life. Every day millions of people spend hours in Facebook or VKontakte, talk about yourself to friends, share information, photos, or videos you get from this communication a lot of positive emotions. What could be nicer than to congratulate a virtual friend happy birthday with cute cards with good wishes or share the fun with friends, laying out just taken photos of the new purchase. The only catch – not all users can quickly understand how to put the picture on his wall. In reality, there is nothing complicated. The interface of social networks such as VKontakte and Facebook has a user-friendly interface. Just need to know some nuances. Including how to place an image on so-called "the wall" – the analogue of the guestbook on the user pages. It does not matter whether you plan to send a picture on my wall or friend's wall - a sequence of actions one and the same. To post a picture on the wall in VKontakte, it is necessary to have it on your computer. To load images from the Internet only links, but in this case, the picture itself will not be reflected. So if you want to photograph is visible at once, save it on your hard disk. Then follow the steps below. Click the cursor in the empty box wall is used for entering new messages. Then at the bottom you will see two additional buttons: "Send" and "Attach". You need a second. Click on the words "Attach" and in the popup context menu select "Picture". This will open a window with the phrase "Upload new photo" and "Browse" button. Clicking on it, you will see that opens the standard Windows dialog with a list of your folders and files. Select those you need and click "Open". After selecting the file on the wall to see an example image in miniature. If this is the picture that you want to publish, click "Send". The image will appear on your wall in a tiny package. View full size in a separate window by clicking the mouse on the picture. If an image is not something that was planned, hover over a cross from the right side of the picture (at this moment appears "not to attach") and click it. Then repeat the procedure for the selection of the file first. On Facebook, the sequence of steps is slightly different. Over an empty field to enter the message posted local menu: "Status, Photo, Link, Video, Question." Select the function "Photo", this will open a submenu with different options: "Upload a photo from your computer", "take photo using web camera", "Create photo album". Select the first option. A window will open saying "Select an image file on your computer" and "Browse" button. Then proceed in the same way as in the example network VKontakte. Only in this case, for downloading, you will see the "Share" button. The picture of a padlock located to the left of her, opens the context menu with the privacy settings to make the picture available for public viewing, only for friends or for you personally. Select the desired item and click "Share". Your picture will appear on the wall in the form of a thumbnail that opens full size on click. To paint the interior need in order to be able to visually imagine how to decorate a room exactly how it will be decorated. And in order correctly to calculate and not to be disappointed in the result, you need to learn the correct building interiorand the space in the drawing. 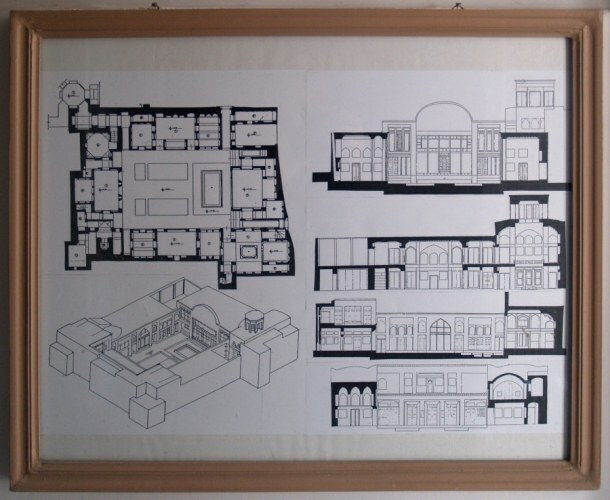 Starting to draw, remember that at the interior ofω understand architectural forms of the premises and the complex equipment of these premises so that everything is interconnected and harmonious. Imagine for a start an ordinary box or draw it on paper. At the far end it determine the location for the door. This is the entrance to the room. It should be noted according to the following scheme: imagine that you are standing in this room, your eye level should be approximately three quarters of the door. Now imagine that the far end of the box is the opposite wall of the roomyou're looking. The level of the eyes, and hence all lines, leaving the space must pass in the middle of the wall at your eye level marked on the door. This will be called the vanishing point. In order to transform internal space of the box in interior, it is necessary to draw walls, floor, ceiling and Windows. All they need is on the lines that pass through the vanishing point. It is now possible, according to the lines already drawn Windows and doors, arrange furniture in the room. You can use the special computer program AutoCad. It in three-dimensional space can be drawn what should be furniture, what length and width it should be, what elements it is still possible to combine. The advantage of working on the computer is that, creating a pattern in three-dimensional space, you can easily twist, consider all sides and move as if you are already in a real room. Don't forget in your drawing the interiorand paint and a numeric value. Such as the height from floor to ceiling, the total area of the room, diagonal from one wall to the other, etc. 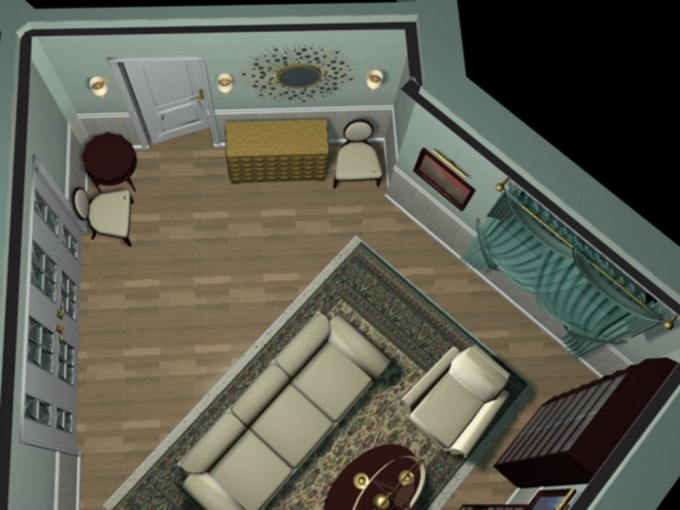 This will help you accurately depict objects and scenery, and will also allow you to calculate how much you have the floor space and how many square metres you can afford to take in this room, so as not to overload its excesses. Interior painting – a unique opportunity to make your home beautiful and original. Many people are not satisfied with ready-made patterns that you can buy in the store, they want to decorate the walls of beautiful ornaments created by hand, or painting, to make the appearance of their homes unique. 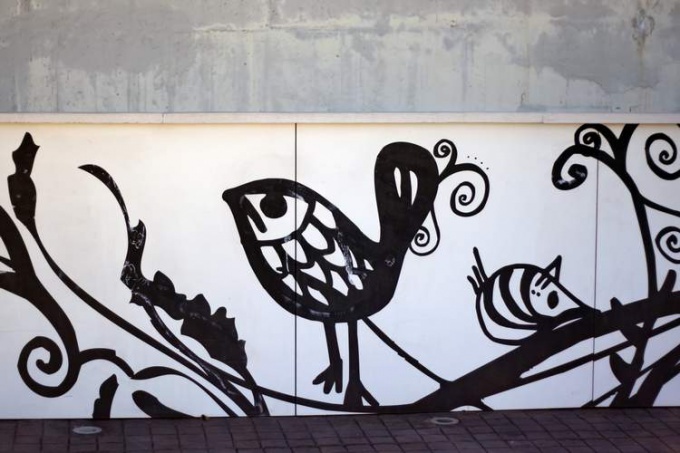 To paint the walls can, if desired, even people without art education. There are various techniques of interior painting. Sometimes when the artist's task is to draw a large and complex picture, on the wall glued on primed canvas for painting, but most of the walls painted over a finish plaster, which is applied to soil firming. For starters, be sure to prepare wall surface for painting – clean the walls from old paint, dust, dirt and crumbling plaster, and then align the surface of the wall, cover it with another layer of plaster, and then slide finish leveling putty or art plaster. Artistic plaster is already possible to draw. Also you can stick it on the wall-aligned plain paintable Wallpaper. The surface of the wall coat acrylic primer for better adhesion of paint to the wall. Think carefully about the idea of the design wall and design sketches illustration. If you have never painted, the best method of decorating walls is to stencil. You can make your own, and you can acquire interior design shops a ready-made stencil with the desired pattern. Also you will need to paint the shades, screen glue, a sponge and paper to cover the floor. Cover the floor with paper or film, and then on the reverse side of the stencil spray aerosol adhesive. Fix the stencil to the wall, tightly clutching it with a sheet of paper, and then mix on a paint palette to get any color that you want to draw a pattern. Now take a palette with mixed colors, type to sponge the minimum amount of paint and begin to gently RUB the paint into the stencil. For decorative effect you can the lower part of the pattern is covered with paint of a different shade, and then to create a smooth transition between colors. Use as little paint in the shading of the stencil. Gradually move the stencil on the wall until it is painted around the perimeter. Separate the stencil from the wall carefully, when you are sure that the paint is already dry. The sketch is the embodiment of ideas. The result of the creative process; a means of finding a specific solution. Make sure it is really true. Learn how to design and find a compromise. Feel like a real designer, draw a sketch of the room on paper. Imagine how it will look rearranged furniture. All the objects depicted in the scale in the corner or front run. Take a white A4 sheet, prepare a pencil and a ruler. Draw a rectangle, but not in the middle of the sheet, and a little higher. Draw to scale, like 1:30. If there is room - 30*4*3M., the sides of the rectangle should be 9*8*4 see Mark the corners of the drawn rectangle with the letters ABC. Draw the horizon line, it should be at human eye level – somewhere 160 cm from the floor. On the paper mark of 450 mm up from the points A and G. draw a horizontal line across the sheet with a pencil of a different color. Mark walls, ceiling and floor. Swipe diagonally from the corners of the rectangle ABC to the point of "gathering" So What are the lines AD and GE. Define another vanishing point. It is needed to build a grid on the floor. To do this, connect via the direct point D and point d, the resulting guide line to the intersection with the "horizon". Divide the line segment AG into several parts. Width of room is 3 m, then each part will be equal to 1 m, Divide the line DE on the same equal parts. These designations connect with a new point of "gathering". You have formed the intersection point through which we must draw a parallel line. The resulting cells is the scale. Each cell is one square meter, but only in a ratio of 1 to 30. Position in this space. Draw a sofa, chairs, table, consider a frontal perspective. Note, the length of the wall will be approximate, it is impossible to portray accurately due to the distortion of perspective. In order to spice up the interior floral motifs, you can use one of many techniques of drawing on the wall. Importantly, the surface was prepared for the interior paint. Make a pencil sketch of the flower on the prepared wall. You can choose a simplified motif, which is used only a few pure colors, but this technique allows you to show your artistic talents so you can draw complex Bud wrapped or swaying in the wind petals. Proceed to the staining, use familiar and well-mixed interior paint. Do your job like you draw on paper placed on an easel. Start with the upper part of the figure, so as not to lubricate the hand in the paint, set aside the little finger of the working hand to the side. To obtain the shades transition from one color to another, use the palette. Create a pattern in stained glass style. To do this, draw a wall-flower with clear boundaries petals, stamens and leaves. Circle them with paint or a special circuit, the main thing that the line width was approximately the same on all parts. Let it dry completely. Complete paint the surface of each part, do not apply brush on too much paint to avoid drips. Try not to put a color on the contour. This way of decorating the interior is especially good if there is a need to create a floral motif enclosed in a geometric shape, e.g., round, oval or rectangle. Use the stencils, they allow you to quickly floral motifs without transitions from one color to another. Duct tape or special paper, draw flowers with clear contours of the individual parts, cut away areas which are subject to shading. Glue the paper to the wall. Roll of foam rubber puff. Ink nesekretnye zone, try not to fall onto adjacent areas. Leave to dry, remove the accessory paper.